You and your spouse have worked hard. Through your marital efforts both of you have gained prestige, expertise in your fields, credibility, and acquired high respects both in your profession and your community, and you have acquired assets for which you are both proud. And then there are your children, probably the achievements about which both of you have the most pride. You also understand the value of the assets and accomplishments you have achieved. Consequently, you don't want to waste them frivolously by paying unneeded attorney's fees or court costs for a seemingly never-ending divorce litigation. Then there are your children. You want them to be able to come through the divorce with the least negative impact as possible. Finally, you want to be able to attend the special events in your children's lives and have the civil interaction with your spouse instead of having nothing but grand core and animosity between you and your spouse during weddings, graduation, and other important events in their lives. You also know that a divorce will divert your attention and focus from more important issues in your life; cause unnecessary and unplanned disruption in your profession, income, and cash flow. It may cause you to liquidate some of your assets; and a divorce may subject the details of your life and the children's lives to public scrutiny that you wish to avoid. In calculating the cost of a litigation divorce, you quickly come to realize that there must be some other option that would be more civilized, less expensive, less timely, and less costly. The answers to those questions is a collaborative divorce. Collaborative divorce is a private form of dispute resolution where you and your spouse each have your own attorneys to provide you with advice and to help you create options to obtain the resolutions of the issues in your case. These attorneys have specialized training to focus primarily on reaching out‑of‑court agreements/ settlements. Consequently, no time, energy, money or effort is spent on expensive, time consuming and, sometimes, provocative trial tactics such as fishing expeditions, invasive discovery request, or untimely or oppressive depositions and hearings. The attorneys are there to assist both of you in reaching an agreement and moving on with your lives. There is no doubt that a divorce is an emotionally traumatizing event for any individual. You may be a hardened business negotiator and think that you are immune from emotional upheaval. Nevertheless, a divorce will divert your attention and focus and will disrupt your work and your career. Even if you are relatively unaffected emotionally by the divorce your spouse may become an emotional wreck. With this in mind, a collaborative facilitator aids you, your spouse and your attorneys through the collaborative divorce. The collaborative facilitator is neutral professional. The facilitator is a specialist in communication, family dynamics, interspatial negotiation, and/or childhood development issues. A facilitator works with you, your spouse and your attorneys to focus on the future rather than the "arrows and afflictions – both real and imagined – of the past. The collaborative facilitator also assists everyone engaged in the process in interest-based negotiations rather than the rigid traditional positional based negotiations. If you have children, the facilitator may assist in crafting a developmentally appropriate parenting plan which will fit your children's needs as well as you and your spouse's needs. Instead of going to court and facing a cookie cutter kind of parenting plan rigidly imposed upon you and your children by the court, a collaborative divorce will provide you the opportunity to build a flexible plan that meets both the needs of your career/profession and the needs of your children. In any divorce, the parties will be concerned about their finances, both now and in the future. Generally speaking, one spouse will be earning more than the other. Consequently, the less financially enabled spouse will be concerned about making sure that he or she has a full view of the financial picture of the marriage and that their financial needs are going to be fairly met. The parties deal with a neutral financial professional and agree to full financial transparency. This means that the financial professional will obtain any document that's necessary for the neutral financial professional to come to a comprehensive and full understanding of the financial picture of the marriage, the income of the parties, and the needs of the family. A financial professional will assist the parties in developing options which meet their needs in terms of the division of marital assets, alimony, child support and other financial issues that they may be facing. This is far different than in the traditional divorce court scenario whereby the judge has limited discretion in which to fashion orders concerning division of marital assets, alimony, and child support. The parties' options are unlimited in terms of proposing creative and unique solutions for their financial issues and needs. The collaborative process is fully confidential. 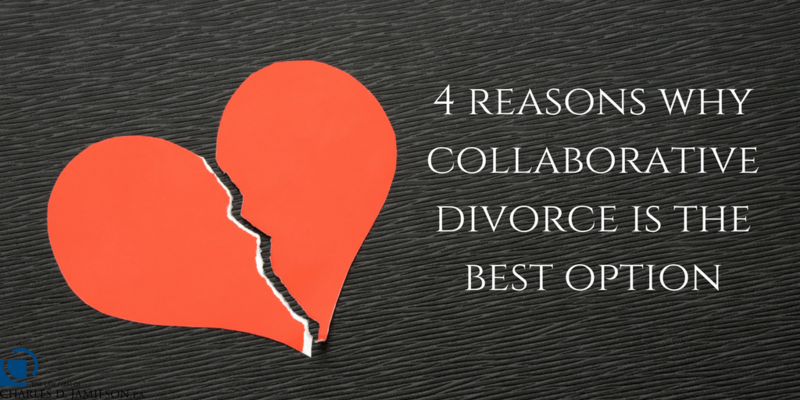 A collaborative divorce occurs in the form of a series of private meetings. The private meetings for divorces take place in private conference rooms rather than in the public courthouse where the public can sit in on any hearing in your divorce case. In addition, the documents in a collaborative divorce that are analyzed are also private and confidential and are not exposed to public scrutiny as would occur in a traditional litigation divorce. 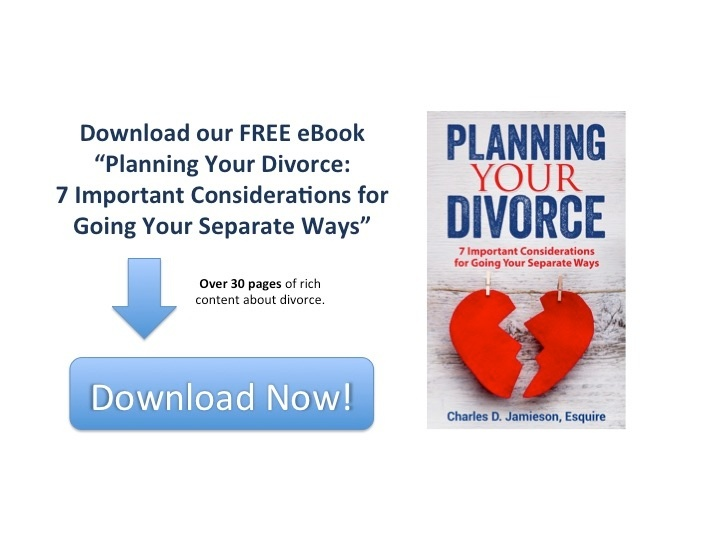 If you are an individual contemplating divorce, then less expensive collaborative divorces avoid the necessity of dueling experts, unending depositions, repetitive motion hearings, and attorneys sending dueling emails to each other on a daily basis. The process is generally completed in four to six meetings. Although, although you are paying for the services of a neutral financial professional, a collaborative facilitator, and two attorneys, the process is far less expensive than that of the traditional litigated divorce. Consequently, if you are an individual, who is contemplating divorce, then the collaborative divorce process would greatly benefit you and your family. Board Certified Marital and Family Law Attorney Charles D. Jamieson understands that divorce is an extremely sensitive and important issue. Thanks to extensive experience and a focus on open communication, Attorney Jamieson adeptly addresses the complex issues surrounding divorce while delivering excellent personal service. To discuss your divorce, please contact The Law Firm of Charles D. Jamieson, P.A. online or call 561-478-0312.